For many women who are either experiencing this stage or will soon experience it, it is important for them to better understand what perimenopause entails, including: knowing what perimenopause is, at what age perimenopause occurs, and the different tests available to diagnose perimenopause. While many women understand the basics of menopause, fewer women recognize the signs of “perimenopause”. Perimenopause is the second menopause stage, which occurs after pre-menopause. While many women are fully fertile during pre-menopause, perimenopause signals the gradual decline of women's reproductive functions. As a perimenopausal woman's body is preparing to permanently shut down the ovaries, this causes a natural decrease in estrogen and progesterone levels. These decreases in hormone levels are the primary cause of most perimenopause symptoms. Follicle stimulating hormone (FSH) test. Because FSH levels increase during perimenopause, a test of FSH levels can help determine if the second stage of the menopause process has begun. Estrogen test. Usually performed over a period of several days to measure fluctuation, estrogen tests are a good way to detect the presence of perimenopause. 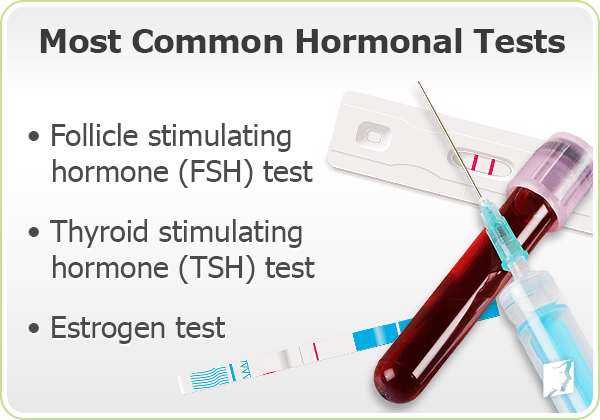 Thyroid stimulating hormone (TSH) test. If symptoms similar to those experienced during perimenopause are present, doctors will usually perform a thyroid stimulating hormone test to check for problems with the thyroid. Perimenopause is the life stage that precedes menopause. During this time of hormonal change women are more likely to experience a variety of unpleasant symptoms. The conditions that accompany this transition however, are manageable and should not be allowed to negatively impact your life. Read the following article for more information. Perimenopausal weight gain is a common experience for older women, but it can be combated by taking a sensible approach to dieting. For more information and advice on the smaller lifestyle changes you can make to prevent weight gain, check out the article. During the 2-10 years preceding menopause women are likely to experience wide ranging symptoms because of hormonal changes. While each ladies transition will be different, keeping a healthy diet and exercise routine will lessen many of the common symptoms. Check out the article for more information and advice.